Have you ever bought an ingredient in bulk at Sam’s Club or Costco only to wonder weeks later just how you’re going to use it all? Yep, me too. More often than I care to admit. My latest “bulk buy” was a mega-huge-monster-sized bag of Pecorino Romano cheese. Luckily, I love the taste of Pecorino Romano and it lasts a long time in the fridge or freezer. But because this mammoth-sized container of CHEESE has been staring at me every time I open the refrigerator, I’ve been challenged to come up with new recipes worthy of this great ingredient. When I heard that today was National Pistachio Day (and I LOVE me some pistachios), I decided I’d whip up some pistachio-pecorino flatbread for lunch. I had some leftover turkey breast that I could shred for protein and some delicious sun-dried tomatoes that would be a great accent flavor. It was only 9:30 am but already I was psyched for lunch! I used a package of Pillsbury® Original Crescents. 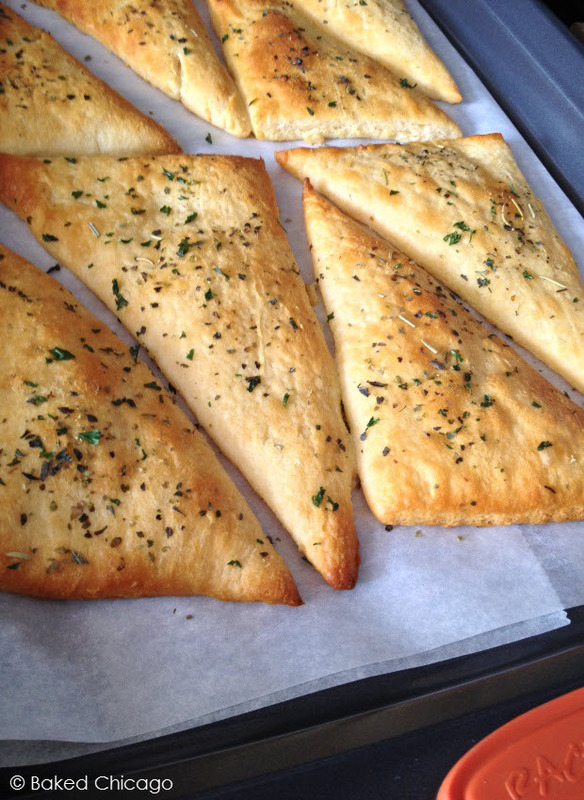 Just unroll the dough on a prepared baking sheet. Brush with extra virgin olive oil and season with parsley flakes and Italian seasoning. Bake for about 10 minutes or until golden brown. Then remove from the oven and cover with shredded turkey breast, diced sun-dried tomatoes and generous amounts of shredded Pecorino Romano cheese. Note: in the photographs, you’ll notice I used grated Pecorino Romano cheese, which was fine but tended to fall off the flatbread. I’d recommend using shredded Pecorino instead so it has a chance to “hang on” to the flatbread better. Pop it back in the oven for about 5 minutes, or until the cheese is melted and bubbly. Then sprinkle with chopped pistachio and you’ve got a great lunch for 2 to 3 — or apps for 4 to 6 folks. This would also be a great (and super quick) Academy Awards viewing party appetizer. Just saying. Enjoy! Preheat oven to 375 F degrees. Line a baking sheet with parchment paper. Unroll the dough and arrange the crescent dinner rolls on the baking sheet so they are lying flat. Drizzle each with olive oil. Using the back of a spoon, spread the olive oil to cover the tops. Sprinkle lightly with Italian seasoning and chopped parsley. Bake for 8 to 10 minutes, or until light golden brown. Remove from oven. 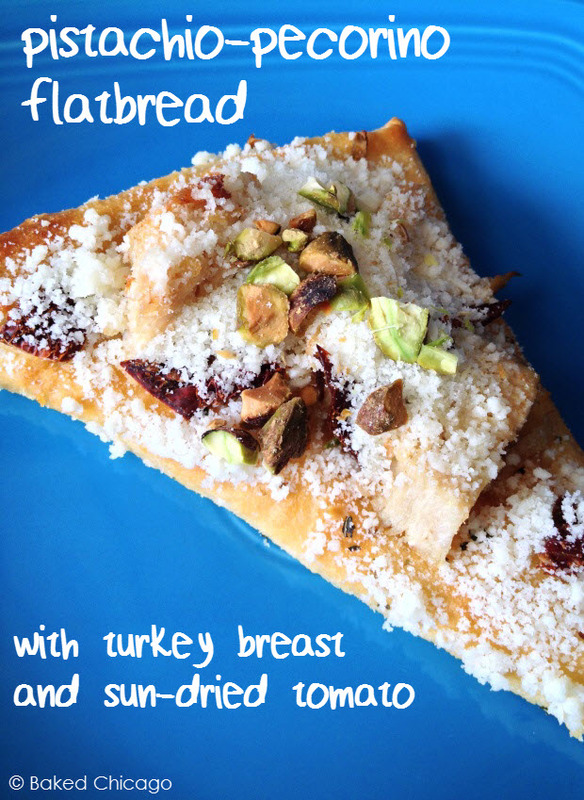 Place shredded turkey breast evenly on each flatbread piece. Sprinkle with diced sun-dried tomatoes and cover generously with cheese. Bake for another 5 minutes, or until cheese melts. Remove from oven and sprinkle with chopped pistachios. Serve immediately.